It’s a holiday week and what comes with summer holidays? Eating! Especially BBQ inspired eating. My apartment complex actually has some grills they let everyone use, located in our great pool courtyard. After two months of just starring at them, I finally used them! Well, Nick used them, I just gave him some shrimp and vegetables to throw on there and grill up. I really love grilled seafood and grilled vegetables – that rich, smoky flavor is just unparalleled to anything you can do in your kitchen. 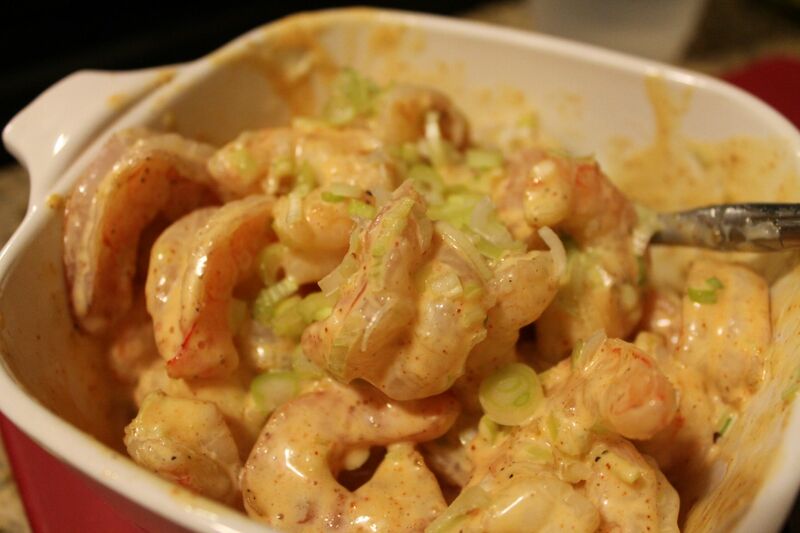 I took this opportunity to try a recipe I found on Pinterest for a Bang Bang Shrimp inspired recipe. The recipe looked promising, not to mention healthier than the original Bang Bang Shrimp, which I believed are fried before they get doused in spicy sauce. The sauce, which includes Saracha to it’s mayo base, makes this. The green onions add just the right bite and color to make it beautiful and delicious. Paired with grilled onions, peppers and some fresh baby spinach and this was a light, but satisfying feast! Another option for this would be to make a Po Boy style sandwich out of this by putting the shrimp and veggies in a toasted hot dog bun. Make sure your shrimp are shelled (and no veins) then rinse and pat them dry. Put them in a bowl and add in the lemon juice and olive oil. Toss the shrimp so they get covered with the liquid mixture. Skewer the shrimp with 4-5 shrimp on each skewer. (Remember: You should soak wooden skewers for about 20 minutes before loading to avoid them burning on the grill). Grill for 6-8 minutes on each side (or until they are opaque and cooked through) and remove from heat. Grill vegetables to preferred tenderness. Mix the mayo, saracha, honey, spice and 3/4 of the green onions together in a medium bowl. Add in the grilled shrimp and toss to cover them all. Place a handful of baby spinach on a plate, then top with a skewer of grilled vegetables. Add shrimp (however much you want) on top of the veggies and top with the scallions. 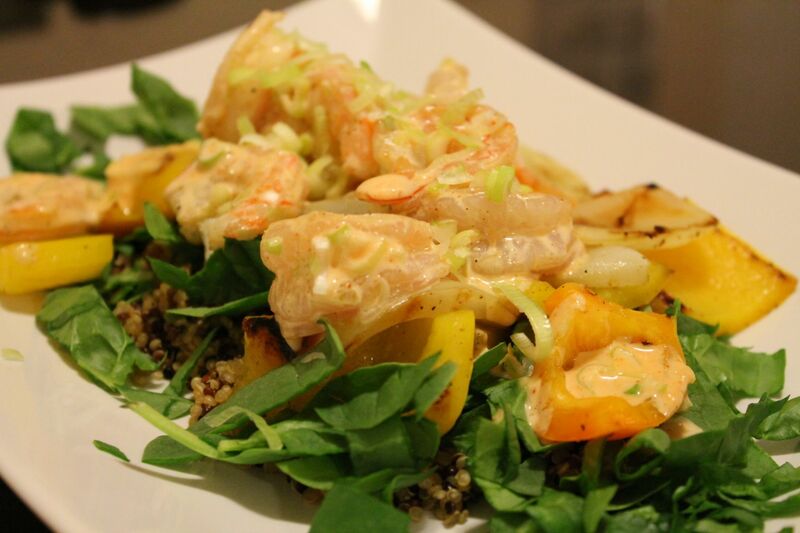 *Optional: Add some plain cooked quinoa to this dish for an extra protein kick! Have you been doing any grilling this week? What do you like to grill? yum that looks so delicious and creamy! 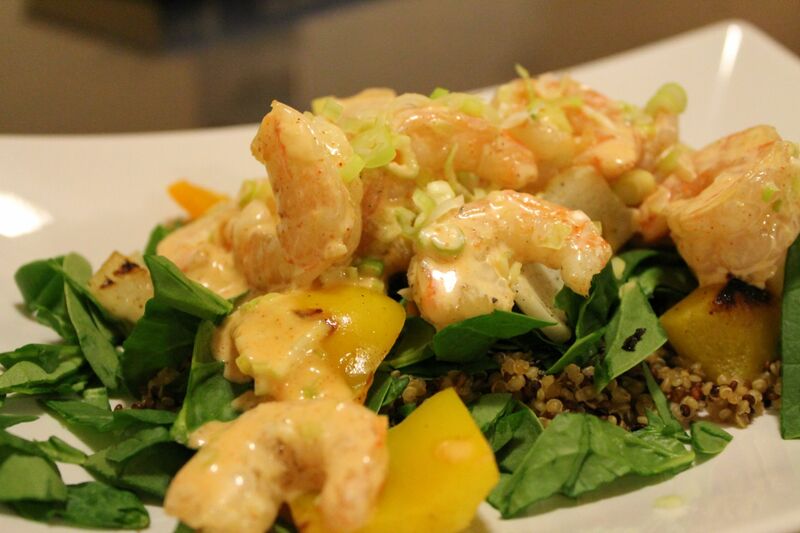 grilled shrimp is definitely great for the summer!